Makita have been in the forefront of the development of Lithium Ion batteries and several of their L-Ion powered tools have been reviewed in this magazine. Latest to come my way is the LCT 204W 10.8V set, consisting of a drill/driver with two speed ranges (DF330D) and a variable speed impact driver (TD090D) that delivers 3000 impacts per minute. Both tools have been available separately but the latest versions are now presented together in a very neat carry case complete with a battery in each, and the charger to go with them. I was immediately struck by the diminutive size and balance of the tools since my elderly hands are small and rather arthritic and I simply cannot cope with the 18V and upwards monsters. The small size also enables them to get into tight corners when working on kitchen cabinets, shelf units etc. 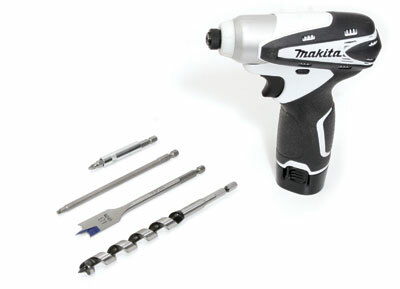 The drill/driver has two speed ranges: 0-350 and 0-1300 rpm. Drilling capacities are quoted as 21mm in wood and 10mm in steel. For driving, a torque ring with eighteen different settings controls the clutch, but the beauty of having the set is that you can keep this one for drilling your clearance holes then switch to the other to drive the screws. 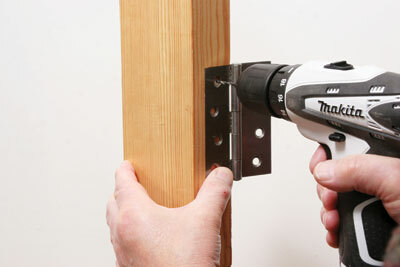 The little impact driver packs a formidable punch, driving quite long screws without effort. It comes into its own, however, when you want to remove a reluctant screw, as when dismantling a frame or repairing a piece furniture. The quick-fit chuck accepts 1/4in hex-shanked bits with an insertion portion (the bit that goes into the chuck) 9mm long from the groove machined in the shank. Most of my existing bits were this length but I found one or two where the insertion portion was 14mm long. These wouldn't go in the chuck. 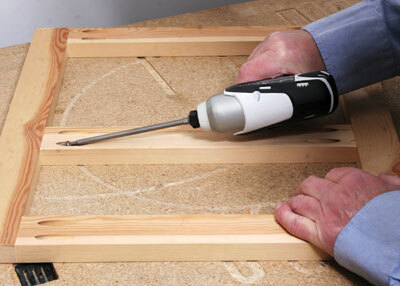 The impact action kicks in as the resistance of the screw increases and is permanent i.e. you can't switch it off. This makes it noisier than the drill/driver but I doubt that it will worry you if you are faced with a rusty screw or bolt. 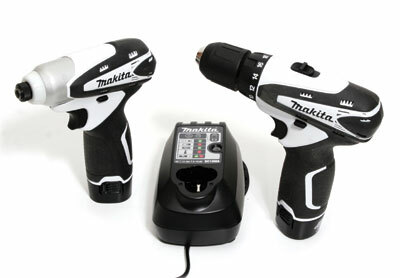 These are quality tools that will find many uses both for the tradesman and around the house. They are light, powerful and do their job. At current street prices they represent excellent value for money. "They are light, powerful and do their job"